This genealogical data file is based on more than 40 years of research. There are, nevertheless, many blanks and very possibly errors as well. Please feel free to contact me with any updates and corrections. You are also welcome to make use of this information and incorporate it into your records. However, please do me the courtesy of acknowledging this web site as your source. Data appearing in this web site is only partial. In order to limit the extent of the data, for example, emphasis has been placed on people whose surname is Hande, or who have a parent or grandparent who once bore that surname. Also, in order to protect privacy, details for living persons are not provided. 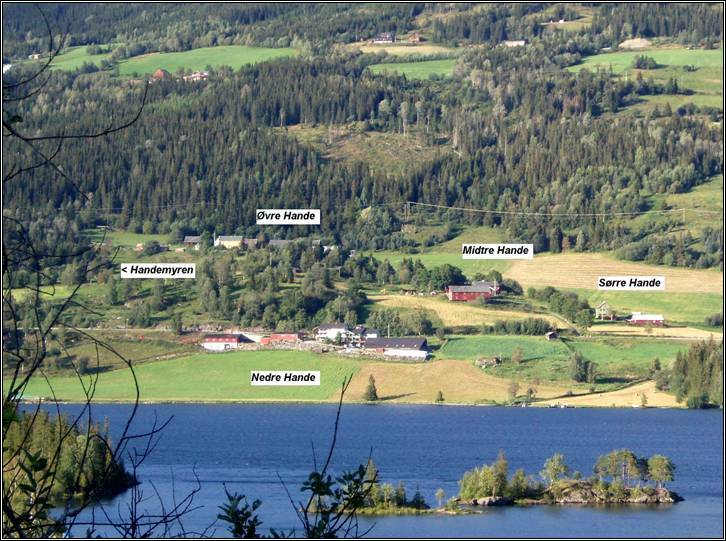 Hande is the name of a cluster of farms, once a single large estate, in Vestre Slidre parish (Valdres region), Oppland County, in south-central Norway. The custom in rural Norway, up to about 1900, was for families to take as their surname the name of the farm where they lived. Thus, a family group could change its name several times over the years as they moved from one farm to another. This would be particularly common among “husfolk” (tenant farmers). People were known by one or two given names, then the patronymic (taken from the name of the father) was included, and finally the farm name was added. As examples, “Halvor Johannesson Hande” or “Inge Marie Nilsdatter Hande.” In this database, the surname of the individual at birth is normally considered that person’s primary name, although it may have changed in subsequent years. If a search by surname does not find your ancestor, try searching by the first name(s) instead. For further information, please do contact me.